This book first came to my attention through an Amazon recommendation based on previous purchases. After reading the synopsis I made a note of it and added it to my future purchase list. I attempted to read one or two other books I had lined up but for some reason this book was taunting me; I just couldn’t get it out of my mind. Finding and reading it became a near obsession! Here’s my review. So Long a Letter (Une si longue letter) was originally written in French and translated into English. 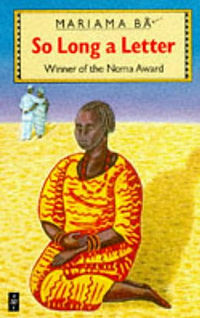 It is written in the form of a series of letters by Bâ’s main character, Ramatoulaye, to her friend, Aissatou. Ramatoulaye has been recently widowed and during her 40 day confinement she reflects on her life choices and experiences as an African woman. She relives the pain of being abandoned by her husband for a second wife, and her struggle to support her twelve children. In telling her story Ramatoulaye recounts the early years of her marriage, the friendship with Aissatou and her husband Mawdo. Both men are relatively successful in the newly independent Senegal and enjoy the benefits of education, which allow them to advance in their chosen fields. When Mawdo takes a second wife, Aissatou refuses to be a co-wife and takes the unprecedented step of leaving with her sons. In her farewell letter she writes, “I am stripping myself of your love, your name. Clothed in my dignity, the only worthy garment, I go my way” (p. 32). In doing this she abandons the tradition of her culture that condones polygamy, and moves to the United States. She finds no dignity in being forced into a polygamous marriage, and she does not accept Mawdo’s argument that he loves her best and is only marrying another out of duty to his family (read interfering mother). Later, when the same fate falls on Ramatoulaye, she chooses to stay. She states that she cannot set aside her love for Mawdo and her sense of duty to the family. She accepts her condition despite Mawdo abandoning their home in favour of his young wife and her family. The friendship between Ramatoulaye and Aissatou does not suffer as a result of their different choices. It in fact becomes stronger, as they support each other emotionally through this deeply personal experience. And through the letters we see how much they share and how the strong the bond is between the two. Throughout the book we see the evolution of Ramatoulaye’s self-discovery. While she laments the ‘slender liberty granted to women’ and in particular the plight of first wives who are ‘despised, relegated or exchanged… like a worn-out boubou (robe),’ the tone of her language is not that of a bitter woman. After her abandonment she embraces the independence of sustaining her family with her own wages, learning how to drive and going to the cinema alone. This allows her to not only survive but to thrive! So, was this book worth the read? Most definitely! It is very well written and engaging. Some parts of the book were a little hard to follow but I think that’s a small price we pay when translating from one language to another. However, this didn’t overly detract from the pleasure of reading the book.